Chaddy knew that there are basically two types of Black labs. The first type is intelligent, sturdy, and has an unrelenting desire to hunt, fetch, and swim. The second type is wily in the ways of obtaining food, large framed, and has an unrelenting desire to lay down in a comfy bed. Chaddy was of course the second type of black lab. He was of the most loyal nature, and therefore followed our every foot step (especially in the kitchen). Chaddy to his credit, had climbed mountains, crossed rivers, and hiked many trails. On occasion, Chadwick felt the impulse to rip the stuffing out of one of his numerous stuffed bears, but this was rare indeed and most of his toys were only partially eviscerated. As it would be far too much trouble to complete the task. 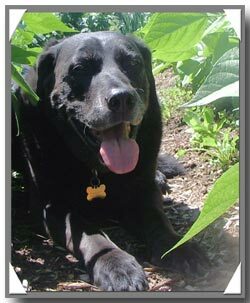 His favorite foods were Nutro Max large breed senior dog food, Nutro senior canned food and anything the cat has left. We’re so very sorry to report that our very special friend has left us and is on that journey we will all be taking some day–We miss you buddy, and we perhaps someday we will meet again.